Photo courtesy of Dave Kloiber ’65. Securing Conference Championship titles the past two years, it was about time for the F&M Ice Hockey team to truly be challenged in their play…or so we thought. This hockey season, the F&M Ice Hockey team moved from the Patriot Division to the American Division of the DVCHC, where they now face teams such as Rutgers Camden, Johns Hopkins, Widner, East Stroudsburg, and Salisbury. Currently tied for first place along with Rutgers Camden, F&M holds a 5-1-0-0 record going into their final two games of the season. Historically, F&M Ice Hockey has always been strong. Dave Kloiber, a F&M alumni who graduated in 1965, was part of two legendary F&M Ice Hockey teams. 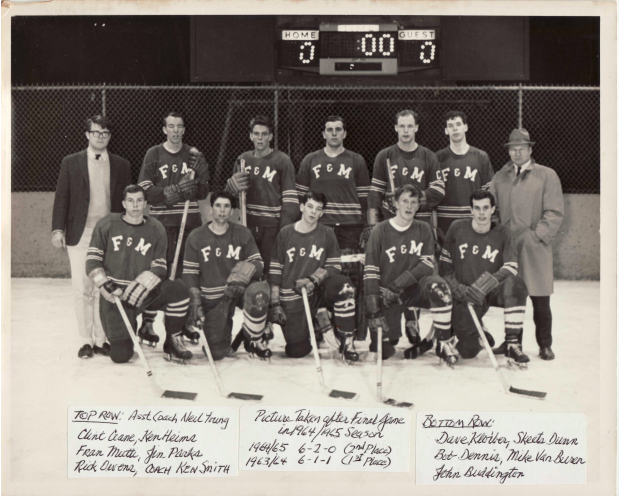 As Champions in the 1963/64 season and runner-ups in the 1964/65 season, F&M Ice Hockey itself has since changed, but their winning record and strong set of skills has not. “We practiced at Hershey using the Bear’s ice and had our “Home” games at that same location. I remember spending many hours on road and only small numbers of supporters cheering us on. There were only 10 of us excluding out coaches–or a total of twelve making up our team, but that small number created strong bonds,” said Dave Kloiber, ‘65. Due to lack of nearby ice, operating funds, and new players, the 1965 Diplomat Ice Hockey team was the last year of the program for quite some time, however, the friends, strong bonds, and memories he made as part of the F&M Ice Hockey team have lasted him a lifetime. “I like to think we were part of a revitalization of sport at F&M with strong swimming, wrestling and in my final year, football with Seiki Murono and Quarterback leading an undefeated Hall-Of-Fame team” added Kloiber. Now living in Australia, Kloiber is happy to know the sport is in such capable hands, as he enjoyed it so much during his final two years at F&M. Whether it’s Ice Hockey, Football, Soccer, or anything else, such stories go to show us the bond that F&M has truly helped some of us to form through sports and athletics here. Early morning practices with our teammates, long drives, and the emotion thrown into the game for the sport we love, experiences last a lifetime, no matter how similar or different they might be. The F&M Ice Hockey team finishes out their season with an away game this Sunday, January 27th at East Stroudsburg and an away game on Saturday, February 23th at Widener University, where they hope to secure two wins, and with those, another conference title.